(Bloomberg) -- Whatever you do, don’t call it a tax. Voters in Washington state will go to the polls Nov. 6 to decide whether or not they want to impose a first-of-its-kind “fee” on carbon emissions. Ballot initiative 1631 marks the second time the state will vote to put a cost on emissions. A prior effort, labeled a carbon tax, failed when it was on the ballot two years ago. Proponents including Democratic Governor Jay Inslee and Microsoft Corp. co-founder Bill Gates are hoping the new proposal -- which the state estimates would raise $2.3 billion for clean-energy investment by 2025 -- will win more backing. If passed, it would be the first effort of its kind enacted by referendum anywhere in the world, making the state a global leader in climate policy at the same time the Trump administration is reversing some federal measures. “If it passes, it would encourage carbon-tax supporters in other states -- as a matter of political reality, this means ‘blue’ states -- to pursue analogous referendums,” said Pavel Molchanov, an analyst at Raymond James & Associates in Houston, said in an email. Because Washington is already one of the cleanest U.S. states in terms of greenhouse gases, a carbon fee would be less of a burden for households there than in other places, according to Neelesh Nerurkar, vice president with the Washington-based research firm ClearView Energy Partners LLC. Fifty percent of registered voters support the measure, with 36 percent opposed, and 14 percent undecided, according to a poll conducted Oct. 4 to Oct. 9 by Elway Research and Crosscut, an online news provider. The margin of error is 5 percent. The idea is to make carbon pollution more expensive so people will use less fossil fuel. 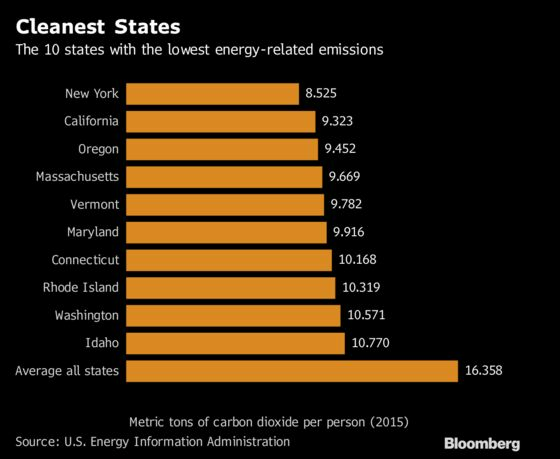 Though with abundant hydroelectric power, Washington is already among the least carbon-intensive states in the nation, ranking ninth lowest in U.S. Energy Information Administration data. 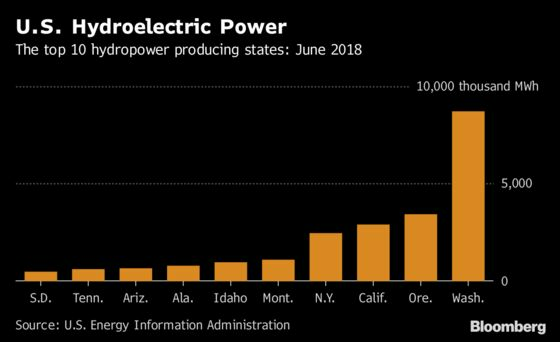 It produces more hydroelectric power than any other state -- more than double Oregon, which ranks second. So the Washington measure isn’t likely to change the world, but “doing something is better than doing nothing,” said Robert Stavins, director of Harvard University’s environmental economics program. Ballot initiative 1631 would impose a fee beginning in 2020 on major emitters of carbon dioxide, including refineries, power utilities and oil and gas producers. The amount would start at $15 per ton of emitted CO2 and increase by $2 a year, plus inflation, until the state meets its 2035 emissions goal to cut CO2 to 25 percent below 1990 levels. The “NO on 1631” political-action committee estimates it would increase state gasoline prices as much as 14 cents a gallon. The group led by the Western States Petroleum Association -- which faults the measure for exempting other major polluters -- has amassed more than $21.3 million to fight the state proposal. Washington is the fifth-largest state in terms of refining capacity. The measure “creates an un-level playing field within our industry, raising energy prices and failing to provide adequate transparency and accountability,” said Jamal Kheiry, a spokesman for Marathon Petroleum Corp., one of the top corporate donors along with Phillips 66 and BP Plc. The United Nations Intergovernmental Panel on Climate Change released a 700-page report chastising world leaders for their inaction on cutting greenhouse gas emissions and William Nordhaus of Yale University won half of the 2018 Nobel Prize in economics for research on how carbon-emissions pricing can drive change in the energy sector and in consumer behavior. The money the measure would raise is earmarked for environmental and community programs -- not the state treasury -- meaning it’s technically not a tax, Harvard’s Stavins said. In the 2016 referendum, 59 percent of Washington voters rejected the carbon tax, which would have used revenue from the levy to cut other taxes and provide rebates to low earners. Environmental activists broke ranks over what to do with the proceeds, with some pushing for spending on renewable energy, public transit and communities inundated with pollution. The 2018 version, developed in consultation with labor and social justice groups, American Indian tribes, communities of color, health organizations and business groups, is more politically viable because it invests in programs people want, said Mo McBroom, director of government relations for The Nature Conservancy, which has pumped $1 million into the pro-carbon-fee campaign. A third of the money raised will go to addressing forest-fire risk and water-supply issues and the rest to carbon-reduction strategies. Average household fuel costs would rise by $13 a month, according to the Washington State Budget & Policy Center, a Seattle-based group that develops and analyzes economic and policy proposals.